Lead Statuses are used to update the status of a lead. There is a buyer specific API that will allow the purchasing buyers to assign a status to a lead. This information from the buyer will be updated in the lead status report to give you real time metrics on lead quality. 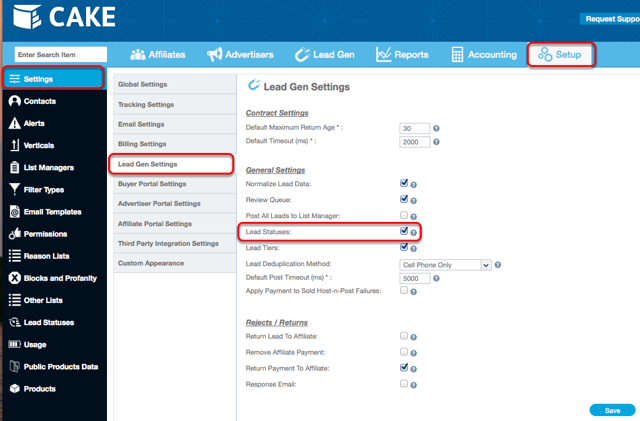 Lead Status is a buyer specific setting. Go to your main Setup tab > Settings > Lead Gen Settings > check the Lead Statuses box and click Save. Now that this feature has been enabled in your CAKE instance you can click on the Lead Statuses Sub-Tab on the left. 1. Status: Is the primary status to be assigned to a column in the Lead Status. Example: Funded, Sold Paid in Full, Unqualified, In Progress, etc. 2. Sub stats: Can be assigned as a drill down to the primary column(status). 3. Field: This section allows you to add custom fields to be updated via API in real time. To add a new field click Add > assign a label, a field name, Vertical, Buyer or both, and a data type. The data type is important to consider when adding a field, for example you cannot SUM a String data type. 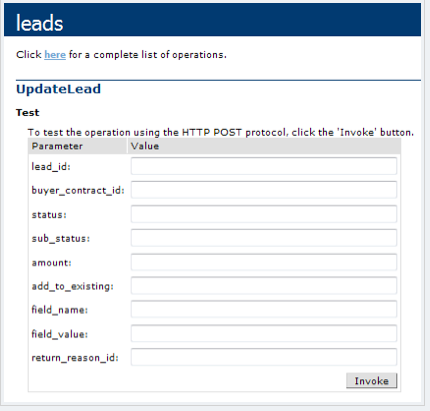 The Master Lead Status Report houses all of the custom statuses in columns created in the previous step. Example: Funded, Sold Paid in Full, Unqualified, In Progress, etc. Each line item in this report is the campaign that generated the lead. The sum column (above in red) is used to SUM number fields updated via API. For example, if test_name were a number data type then a value can be assigned. This report would then SUM that value on every updated lead, breaken out by campaign. Show Changes-When enabled, only leads that have been updated will be displayed. Show Sub status-When enabled, only leads that have been assigned sub status will be displayed. IMPORTANT:This report is most closely related to the lead detail by buyer report. When leads have been assigned a status via API they are found by date sold, not date updated. add_to_existing ~ Add revenue from amount parameter (true/false)? The amount reflects the revenue of the lead, if a lead was to be returned then you can pass "amount=0&add_to_existing=false" in the example the amount would overwrite the existing revenue on the lead. Then you can assign a return reason. Since this report is directly related to the lead status report, you can check your work, by looking up the lead by sold date. A lead CAN be updated multiple times. If a lead needs to be updated at each step in a multi-step process it will not effect it. Sample Request string for the Lead Update API. Pass the return reason 0.